Cabin Fusion - Mid-Century Modern meets Rustic Vibe. The Perfect Couples or Alumni Retreat! Windward House is a place to relax, recharge, refresh, romance, or revisit college life. 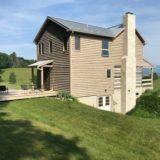 This Shenandoah Valley vacation rental is tailored for people who like a little “hip” in their holiday, combining the aesthetic of Mid-Century Modern, with an eclectic and rural Mountain Log Cabin. Close to Lexington and Staunton, it's 2 bedrooms, 2 baths, and sleeps 4 adults. It is not suitable for children. Adults only please. With approval, we do allow well mannered pets.